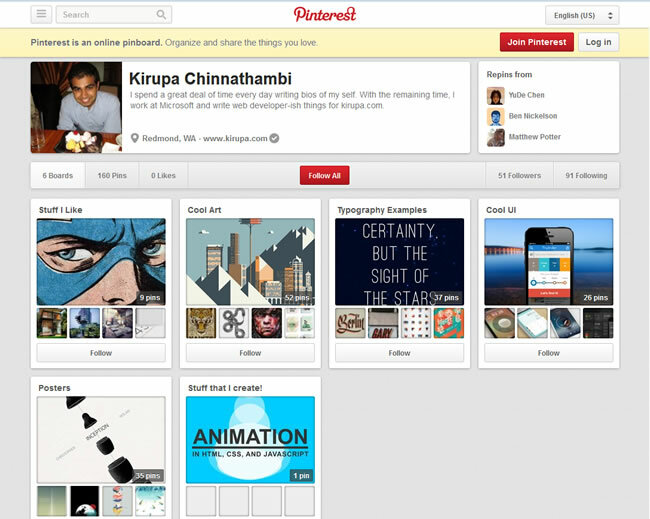 kirupa.com Is Not Dead. It is Simply Napping. In this long article, I am going to describe the way things are and what steps I am taking to turn things around. I feel like I owe a lot of you an explanation, so here is my attempt at doing that. In case you are wondering, the site isn't going anywhere. I am not going anywhere. If you were hoping for something more dramatic, you are going to have wait a few more decades. Before looking at the next steps, it is good to take a few steps back and look at the internal and external factors that played a role in reversing the site's success in helping people out. Let's start with the big one. The success of this site was directly tied to Adobe Flash. 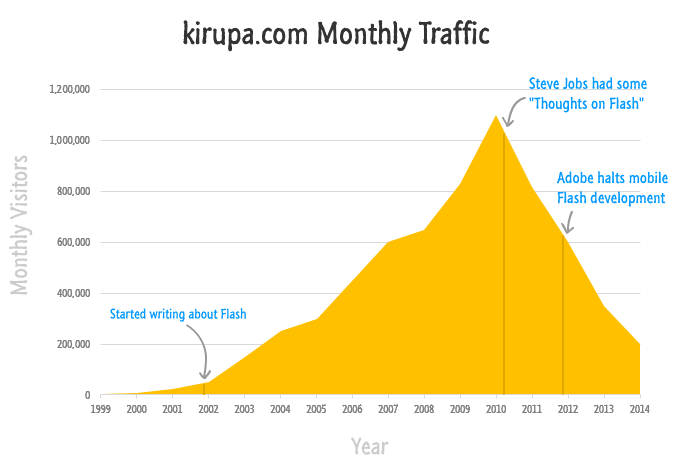 Flash was very much a niche technology when I started writing about it in 2002. As the Flash IDE improved and ActionScript 2 hit the stage, Flash became extremely popular with an emerging group of designers and developers who pushed the boundaries on what can be done inside your browser. This was the golden age of the plug-in, and through pure luck, this site was at the right place at the right time. I also liked writing, art, and programming, so writing about Flash gave me a chance to combine all of my hobbies into one thing. 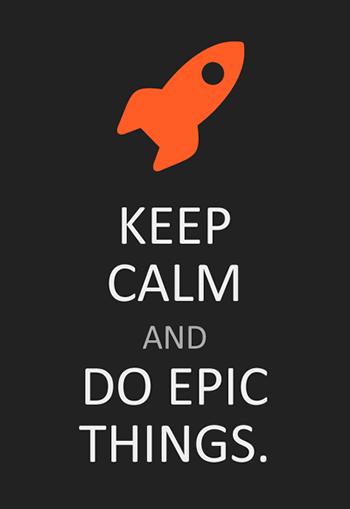 That was pretty much the extent of my rationale for doing what I did. Nothing eventful happened for many years. How people built content for the web was changing, but I didn't really care. Flash was starting to lose some of its shine as performance and accessibility were becoming increasingly important. I didn't care. I kept writing about all the fun Flash stuff I was doing and seeing my peers create. Apple introduced the iPhone in 2007, and it didn't support Flash. Everybody assumed that Apple would eventually relent, so I didn't care at that moment. 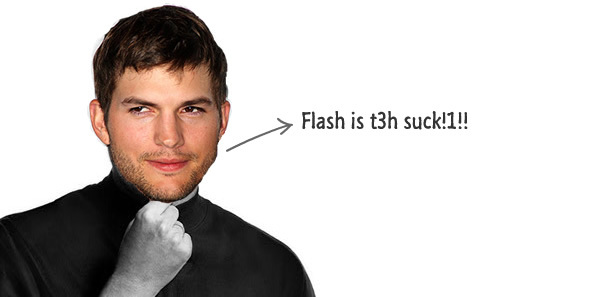 I kept writing about Flash and pretending that everything was just fine. And that was the right thing to do. The site's popularity peaked in April 2010 - 3 years after the iPhone came out, 5 years after everyone thought Java was going to take over the space Flash occupied, and 7 years after everyone said that the large number of web-enabled smartphones in Japan would take the web back to a pure HTML state. Not caring turned out to be a good thing. At this point, almost everybody who was in the creative space had an iPhone. They had preorders for an iPad. Creating content that they couldn't personally view on devices that they spent more and more of their time on was no longer an option. Creating content that their audience could no longer view was no longer an option either. In a very short period of time, Flash was no longer feasible to use for the consumer-oriented space it was so prevalent in. Clients didn't want to pay for a Flash site and an HTML site. Given the decreasing budgets everybody had for creating web content, a lowest common denominator-based solution around HTML was good enough for most people. At this point, traffic to the site started dropping - something that hadn't happened before. It's very obvious why. Why bother learning about something that you knew wasn't going to be relevant in a few years? The site always had two sides to it. One side were the tutorials. The other side were the forums where people discussed things ranging from technical and design issues (which you would expect) to lighter topics like Upside/Downside and the Word Association Game. It was truly a community where a lot of talented designers and developers helped each other and had a whole bunch of fun along the way. 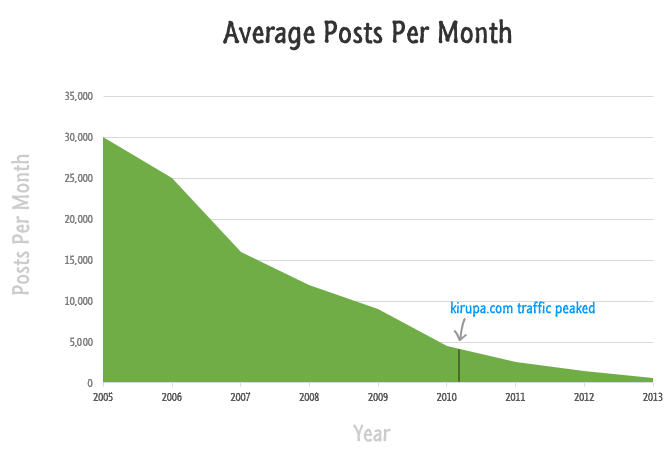 The average number of posts per month has been dropping since 2005. Remember, the site's traffic really grew leaps and bounds during this entire time until 2010 when it peaked. For much of this growth, the forums really weren't a part of the overall success. Those who had a technical question and wanted an answer. Those who wanted to network and hang out with other people like them who had similar interests. Those who wanted to share their knowledge with others. Like many similar communities, the bulk of the registered members fell in the first category. Let's say this is around 95% of the 180k registered members. 4.9% of everyone else fell in the second category where they enjoyed the company of other funny, quirky, and talented people. The .1% fell in the third category - these were the tireless souls who devoted so much of their time to help their peers out. There were no deviations, thank you posts, or anything like that. It was cold, but it was very effective for people who just wanted an answer...which was almost everybody. Their reputation system also incentivized posters for doing great work. This combination of a no-frills question/answer site with a badge of honor if you were really helpful made StackOverflow the primary destination many people went to for getting their technical issues resolved. Now, you are probably wondering why would somebody not want the community/friendly feel that forums provide? That's where Facebook comes in...in 2004 to be exact. Instead of posting and sharing parts of your life on a public forum where almost everyone is a stranger, you now had a social network that was built entirely around your friends and people you were interested in. Unlike the forums, you could build deeper connections with people using Facebook. My personal posting on the kirupa.com forums decreased heavily, for what I used to post there I post on Facebook today. For many, Facebook is the central hub where all online social interaction takes place. Participating in "yet another community" isn't high on people's list when everyone they care about reaching is already on Facebook. Some of the issues with the forums have nothing to do with StackOverflow or Facebook. I made a lot of mistakes along the way as well. Basing the forums on vBulletin was probably the smartest thing I did in 2002. It was the worst thing I did when I didn't move to something better when each upgrade ended up causing more problems than solving. The forums are simply too hard to use, and styling it to look like something more modern is a next to impossible task. The other big mistake, and one that I feel really bad about, is an April Fools prank I pulled a few years ago that ended up angering a lot of good, active members. If any of you who were offended are reading this, I am very VERY sorry about that. By now, you probably learned more than you ever wanted to know about the site's past and why it is where it is today. That was the depressing part. Now comes the hopeful part where I explain what I am doing next. The content is no longer relevant. Flash isn't exactly what people want to learn more about these days. There are many sub-problems as well, but these two capture the big ones that I think need to be addressed immediately. The traffic currently for the HTML5 content is not a lot, but is definitely something that is heading in the right direction compared to everything else on the site. 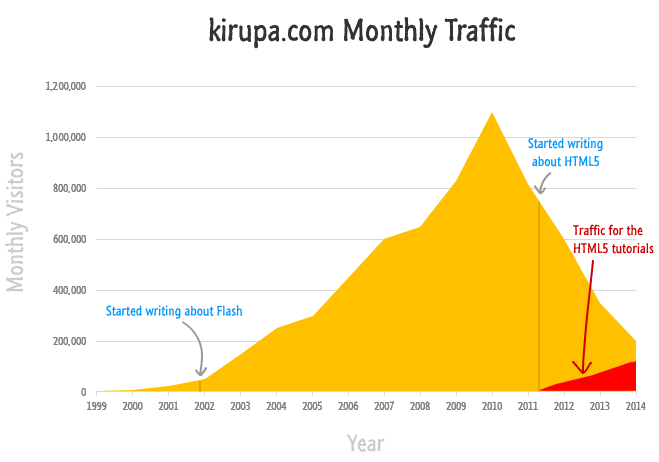 The Flash content on the site will cease to bring any meaningful amount of traffic in a few years. My hope is that the HTML content will be what the site is going to be known for in the future. In many ways, writing about HTML today feels like writing about Flash in 2002. The technology is very new for most people - especially when you talk about interactive sites and apps. There is a lot of great and not-so-great content out there, and there are only a few places (if any) that focus on beginners in a way that actually is easy to understand. 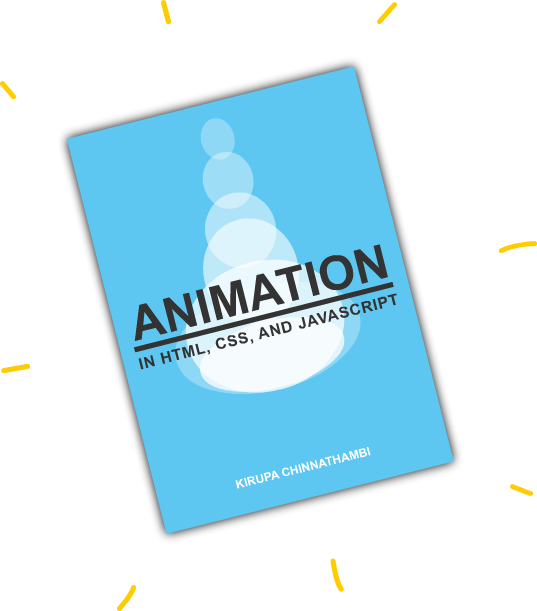 My goal is to take every single Flash tutorial I and others have written on kirupa.com and create an HTML equivalent tutorial of it. So far, that approach seems to be working OK.
No, this doesn't mean I am going to start spamming my Twitter followers and Facebook friends with every mindless update from the site. What this means is that I am going to broaden my engagement with audiences in the networks they are already a part of. 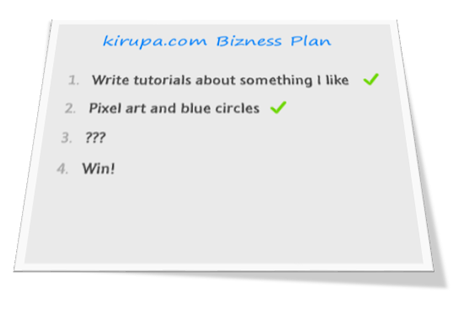 Instead of pulling people to kirupa.com, I am going to bring kirupa.com to them. This makes a lot of sense for me. I enjoy talking...a lot. Recording videos allows me to combine yet another one of my interests into helping people create cool things for the web. Also, recording videos is a lot of fun and acts as a forcing function to ensure the office stays clean! I swore I would never write a book again after my first one many years ago, but I realized that a lot of people consume content in printed form or via ebook readers like the Kindle. If my goal is to help others learn, writing a book made a lot of sense. I hope to write many more based on the content I already post on kirupa.com, so we'll see how all of that turns out. I do like artistic and visual things, and a lot of those things I like inspire the content that I ultimately end up creating. I might make pictures / icons of all of the tutorials I create and post them on Pinterest, but I simply haven't time to explore that further. My focus is not on gaining traffic. It is not in increasing activity on the forums. It is not in attracting more advertisers, followers on twitter, or any of the other things that one might traditionally associate with success. My primary focus is on adding value. If I can execute on the things I outlined above, I have a very good chance of really helping people out and making their lives better. That is the kind of value I want to create. Everything else will automatically follow. With Flash, the site provided tutorials that helped pure designers and non-coders create things that they may not have thought they could create. That was the real differentiator between the tutorials you found on kirupa.com and what you found on sites like Flashkit, Were-Here, Ultrashock, and other sites that were quite epic in their prime. That was the real value the site provided - easy to understand content that demystified the complex. I am very optimistic that things will work out. I am more determined than ever to not only reverse the downslide but to take the site well beyond the heights it was in before. I don't know if things will work out, but the only thing I do know is that the next few years are going to be fun! With all of this said, what do you think? What would you change? 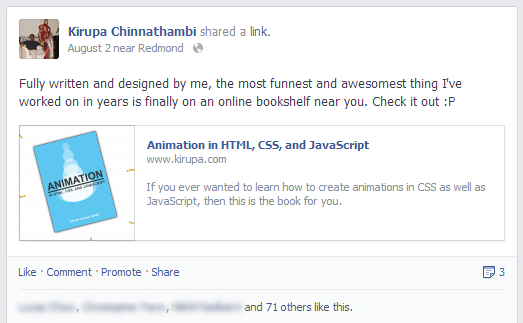 Feel free to chime in on the forums, on Facebook, Twitter, or via e-mail: kirupa[at]kirupa.com.